A young boy discovers that lounging on his favorite sofa playing videogames around the clock is not all it's cracked up to be. His lack of attention to life's basics such as bathing, good food, fresh air, sunlight, and old fashioned exercise wreaks havoc on his young body, and before long our little lad finds himself a prisoner of his own designing, as well as the fascination of many an onlooker as he becomes literally joined at the hip with his increasingly disgusting environment. 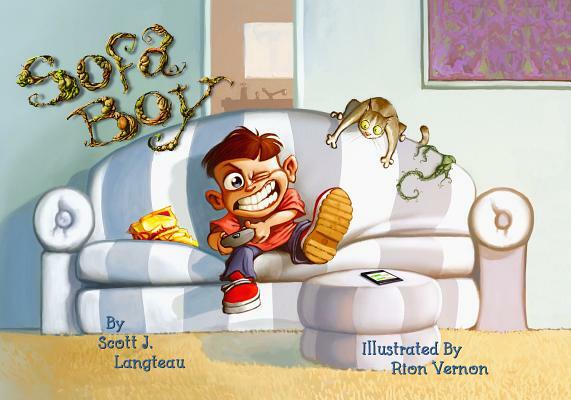 Sofa Boy is a humorous and beautifully illustrated lesson-learned about moderation - a lesson that can clearly speak to all ages, and goes down easily with a warm and hearty chuckle. Scott Langteau has spent nearly 15 years producing videogames for companies like DreamWorks and Electronic Arts. He has decided it was time to help remind upcoming generations of children that there's a whole world of fun outdoors too! Scott now resides in Hollywood California, has a Masters degree in Theatre, and has worked as an actor, writer, and producer in the entertainment industry for almost 20 years.